The Pra Gaew Morakot 2512 BE Pim Song Ruedu Hnaw Nuea Sai Rung Pid Tong Pim Niyom Block Chang Kasem Hlang Yant Duang Prasut Pra Putta Jao Nuea Sai Rung - Emerald Buddha in Rainbow Powders with Gold Leaf, and Buddha's Birthday Sigil, Blessed by Luang Por Tong Rerm of Wat Bang Pra and Luang Phu Rerm, of Wat Juk Gacher. 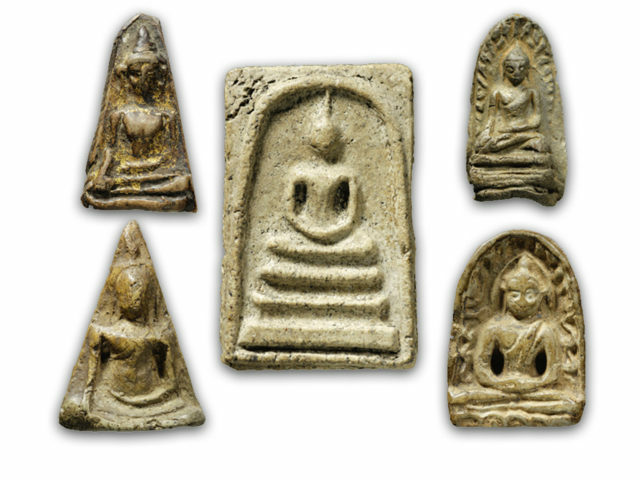 The amulets were Blessed in Buddha Abhiseka at the nearby temple of Wat Bang Pra, in Sri Racha, Chonburi with a host of Chonburi Masters of that Era Present to empower. The Pra Somdej Pra Gaew Morakot is one of the more famous editions, and is collected by devotees of both Luang Por Tong Rerm of Wat Bang Pra, and Luang Phu Rerm, of Wat Juk Gacher. The amulets are now becoming even more highly sought after in recent years due to increased rarity. The amulets were made and released in the 2512 - 2513 BE period, in various models, shapes and sizes. 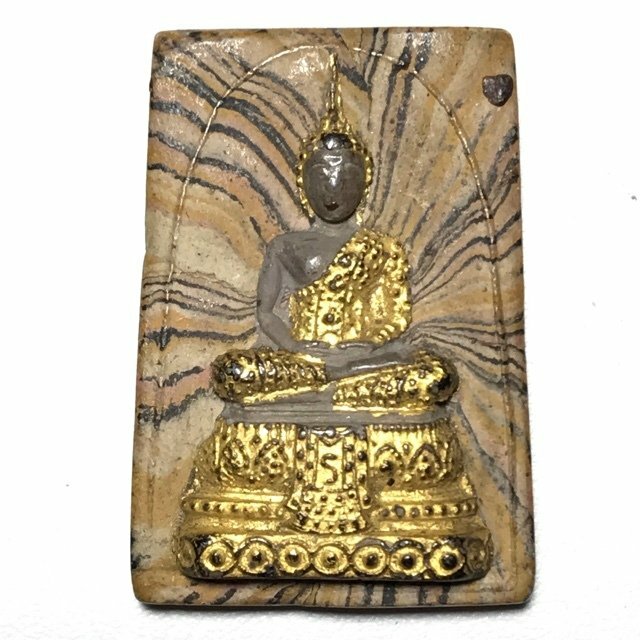 This exhibit is a very rarely seen version, in Nuea Sai Rung rainbow coloured powders with painted Buddha, and gold leaf, measuring 3.0 Cm high x 2.5 Cm wide, and is pressed from the preferred block press of the artisan Chang Kasem,. It was Chang Kasem, who was the Artisan who created the blueprint molds for the amulets of the Great Jao Khun Nor, of Wat Taep Sirin. The front face of the amulet bears the image of the Emerald Buddha, in Winter Regalia, with gold painted embellishments. The rear face of the amulet bears the Sacred Yant Duang Prasut Pra Putta Jao, the Birth Date Astrological Sigil of the Lord Buddha. Below the Yant Duang, are the words 'Luang Por Rerm Wat Bang Pra'. The Pra Gaew Morakot Emerald Buddha amulet was made in all the variations of seasonal robes, and is considered a signature amulet of the great Luang Phu Rerm. The series has now become uncommon to find on the public marketplaces anymore, as the amulets of Luang Phu Rerm are fast disappearing as devotees and aficionados gather them up for their collections before it is too late, and they are no longer to be found so easily. The Pra Somdej Gaew Morakot of Luang Phu Rerm was always a popular amulet due to its great beauty of design, as well as its National Religious Importance as an Object of Bucha for Thai Buddhists. The Pra Gaew Morakot amulets of Luang Phu Rerm are considered a Pra Niyom Category amulet that is known around the world for its great beauty, and for the Metta Maha Niyom Kaa Khaay Maha Lap Serm Duang powers it bestows upon the wearer. Luang Phu Rerm was extremely famous for his Mercy Charm and Wealth Increasing Magic, which is imbued within his amulets. The edition was given a very powerful Blessing Ceremony by some of the Great Monks of the Chonburi tradition, famous for their intense Meditative Focus in empowering amulets, with Luang Phu Rerm presiding over the Buddha Abhiseka ceremony, and Luang Por Ching (Wat Bang Pra), Luang Por Tong Rerm (Abbot of Wat Bang Pra Voraviharn), Luang Phu Boo (Wat Bang Pra), and it is said, that also the Great Jao Khun Nor himself attended to add his Blessings. Luang Por Rerm was a Gaeji Ajarn Master Monk of the Chonburi Province, who despite the fact his amulets are of lesser price than many of his Peers, his reputation, as well as the power of his amulets, and their high demand, are in by no means lesser than that of the much more expensive alternatives, such as Luang Phu Tim (Wat Laharn Rai), and Luang Phu To (Wat Pradoo Chimplee). Luang Phu was however in his time, equally revered and respected as these other Great Masters. 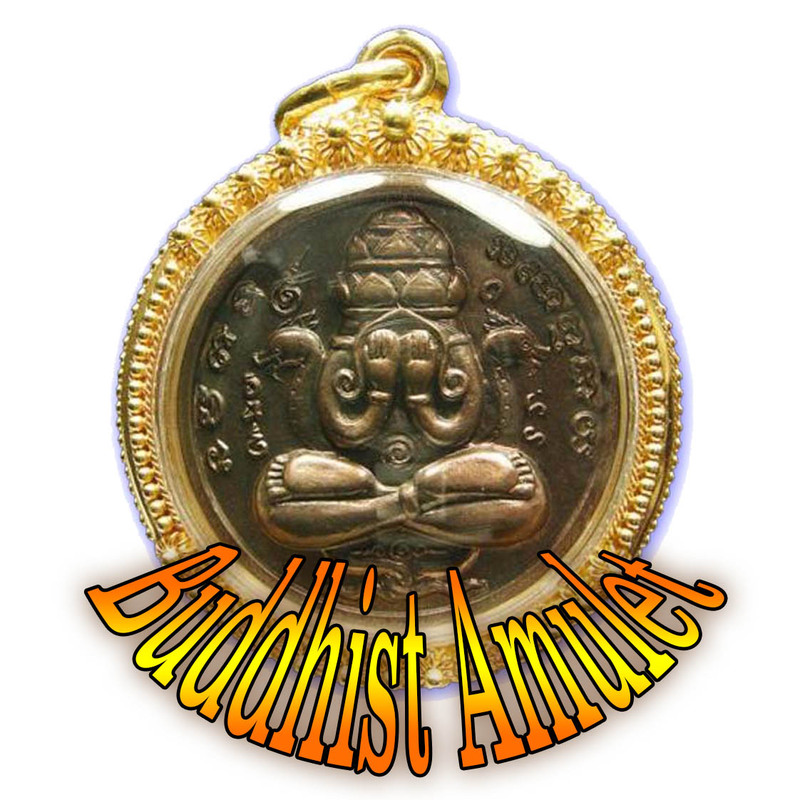 His amulets are considered to differ only in being a more affordable price, but not in any way less powerful, than the amulets of Luang Phu Tim (Wat Laharn Rai) and Luang Phu To (Wat Pradoo Chimplee). Luang Por Rerm was one of the Great Chonburi Masters, whose Merits were many, and reached far afield, such as his payment and donation of the nine Look Nimit Arahant Balls for installation at the Temple of Wat Thai in Los Angeles, United States, in the year 2525 BE. The name of the temple of Wat Juk Gracher, is also the only temple with this name in the country. This is because of an olden days folklore of a place in the forest in what is now known as Bang Lamung (Chonburi), there was a place where woodcutters and hunters and other people who lived in the forests would have some huts, which was known as 'Juk Gacher'. The word 'Gacher' comes from ancient Khmer, and means 'Tree'. There is something about the temple of Wat Juk Gacher, that is told by the faithful devotees of Luang Por Rerm, which is indicative of Luang Por Rerm's great purity of practice as a Monk, which recodrs that all of the abbots who stayed at Wat Juk Gacher before Luang Por Rerm, disrobed and left the Sangha. It is said by believers, that only Luang Por Tong the original developer of the temple, Luang Por Khan and LP Rerm did not disrobe. Only Luang Por Rerm and Luang Por Khan remained until their deaths at the temple. The reason is said to be that the temple was built in a very haunted and wild area of forest, and that only a monk who was able to keep a high practice of purity would be able to survive the temple without disrobing. Luang Phu Rerm Bparamo was born in Sri Racha Municipality in Chonburi Province on Friday the 7th September 2448 BE. He was given the name 'Rerm' with the Family Surname of 'Chiang Aek'. His Father was called Mr. Ming Chiang Aek, and his Mother was called Mrs. Liam Chiang Aek. They were a large family, and Luang Phu Rerm had 1 brother and 9 sisters. Including the youong Master Rerm, there were 11 Siblings in all, who were 1. Master Rerm 2. Miss Tong Dee 3. Master Reun 4. Miss Thome 5. Miss Ob 6. Miss Samruay, 7. Miss Yian 8. Minss Hongs 9. Miss Hwaay 10. Miss Pheung and 11. Miss Tawee. Luang Phu Rerm was always interested in practicing Dhamma and following the Buddhist Path since a very young age, and so when he reached the age of 20, he ordained as a Bhikkhu at Wat Ang Sila Temple with Pra Kroo Suntorn Tammaros as his Upachaya Ordaining Officer. Pra Ajarn Jua (Wat Ang Sila) was his Pra Gamawajajarn Prompting Officer, and Pra Ajarn Lamduan was his Pra Anusawanajarn Witness. Luang Phu rerm was given the Ordained Surname of 'Bparamo'. After his ordination, Luang Phu Rerm went to stay at Wat Juk Gacher, during the time that Pra Atigarn Luang Por Khan was the residing abbot. The reason that Luang Phu Rerm did not ordain at Wat Juk Gacher directly, was because at that time, the temple of Wat Juk Gacher still did not have an Uposatha shrine room, so it was not possible to ordain monks there. Luang Phu Rerm began to study the Dhamma Vinaya diligently, and made great exertions to practice according to the Vinaya. The local Folk noticed his austerities and were filled with faith in his genuine practice. Then, only 6 years after Luang Phu Rerm arrived to stay at Wat Juk Gacher, Luang Por Khan passed away, Leaving Wat Juk Gacher without an Abbot, to administrate and take care of the temple. So the local devotees immediately began to beseech Luang Phu Rerm to take on the task, which he accepted. One year later, the Sangha Comittee elected Luang Phu rerm to become the Bishop of the Municipality, in addition to being Abbot of Wat Juk Gacher. This is incredible when one considers that Luang Phu Rerm was still only 6 years into his Ordained Life, and was not yet either a Thaera (decade or more ordained) not was he a 'Pra Kroo' (academically credited with degree). But his great selfless effort, and ability to administrate and get things done, was enough for his lack of academic degrees to be overlooked. 2530 BE - Resigned as Abbot of Wat Juk Gacher, to accept the position of Abbot of the Royal Temple of Wat Judta Tis Dhamma Saparam Voraviharn in Si Chang, Chonburi, in response to the honor and respect given by the Sangha Comittee in offering him the position, and asking his help. Luang Phu Rerm was endowed with Adept Mastery in Puttakom (Buddha Magic). Luang Phu rerm was always extremely interested in all forms of Buddha Magic and Sorcery since a young age, and since the day he ordained, he hurried to visit various Great Kroo Ba Ajarn to seek out the secrets of many powerful Wicha, and beseech permission to study and practice Wicha Akom under their tutelage. Luang Phu Rerm however tells that his first ever Kroo Ba Ajarn of all, was the great Luang Por Am, the old abbot of Wat Nong Grabork (Rayong). Luang Por Am was a great Master of Wicha Pae Maha Lap Lucky Goat magic, and his carved Goat animist charms were, and still are amongst the most highly sought after of all Masters. Luang Phu Rerm learned the Wicha Pae Maha Lap from Luang Por Am, and Mastered its powerful Metta Maha Lap spell. Luang Por Am also bestowed various other Powerful Wicha to Luang Phu Rerm, including the Wicha See Pheung Jet Jantr 7 Moons Potion, the Wicha Fon Saen Ha Maha sanaeh Metta Spell. But Luang Por Am did not just simply bestow these Wicha on Luang Phu Rerm without testing him first, Before Luang Por Am decided to teach Luang Phu Rerm, he tested his Samatha Meditation and Kammathana abilities, by taking him to a forest cemetery in the dead of night, and binding his wrists with a cord, which he tied behind his back, and strapped to his neck. He gave Luang Phu Rerm 4 Kata Incantations, and told him to sit there in the dark cemetery and perform the incantation until the noose and the hand bindings fell from his wrists and neck. Luang Phu Rerm was able to successfully perform the spell and release his fetters with Magick, and Luang Por Am fervently accepted him as his apprentice. Apart from Luang Por Am, Luang Phu Rerm received Wicha from an number of other Great Masters of that Era, including; Wicha Palad Khik, and Wicha Hnaa Phaag Suea (Tiger forehead) from the Great Luang Por Ee of Wat Sattaheeb, Wicha Hnang Hnaa Phaag Suea from Luang Por Say of Wat Nong Gaet Noi, Wicha Tam Pong 12 Kasat (Sacred 12 Kings Powder making method), of Luang Por Tian, of Wat Bote (pathum Thani), and a host of other Wicha from many Masters, including Luang Por Ong of Wat Nong Ree, Luang Por Phuy of Wat Hnaa Pratat, and Jao Kun Sri, of Wat Ang Sila. Luang Phu Rerm passed away silently after his almsround and eating without anyone noticing, passing away peacefully without letting anybody know or make a fuss over his passing, in the same year as this final edition in 2538 BE on the 19th July, at the age of 90 Years Old.